You wait ages for a Micro Four Thirds camera and two come at once. 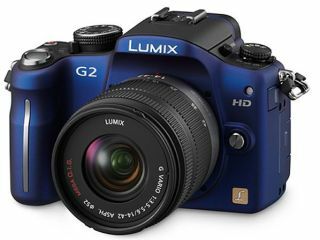 The second release from Panasonic this week, housing the company's Lumix G Micro System, is the DMC-G2. Following up from the mightily successful G1, the G2 is a camera sporting 12.1 megapixel Live MOS sensor, the new Venus Engine HD II processor, double Live-View function, AVCHS Lite high definition movie recording, and a sparkly new iA (Intelligent Auto) mode. The camera's LCD is a 3-inch touchscreen, like its stable mate the G10, and allows the user to release the shutter and use the autofocus with a single touch of the screen. The LCD also offers a 100 per cent field of view, so exactly what you see is exactly what you shoot. The Live View Finder function is another new feature which allows you to see what an image will look like settings-wise, without actually taking the image. This means you can tweak the settings until you get the right look for your image then shoot. Users can shoot HD footage from the G2 as well, with various shooting codecs available, including AVCHD Lite, HD Motion JPEG, QVGA, VGA and WVGA. Alongside Intelligent Auto, there are a number of scene modes to shoot in. These include: Portrait, Night Portrait, Scenery, Night Scenery, Close-up and Sunset. The Panasonic DMC-G2 has a UK release date of June, with price still to be announced.